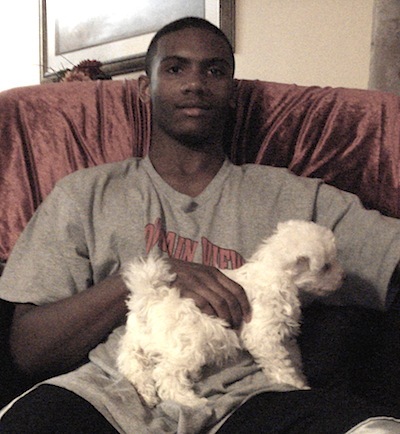 Teen With Asperger's Arrested: Were Callers Racial Profiling? "Someone says 'I see a suspicious black male' and he 'could' have a gun. All my son was doing was sitting in the grass at the library. And you shut down six schools and go out on a manhunt. Reginald Latson loves to walk. "He'll walk five or 10 miles, it's nothing to him. Sometimes he walks five miles just to grab a bite to eat at Chili's," says his mother, Lisa, who lives in Stafford, Virginia. "Walking is his release." Neli, as his family calls him, is 18 and has Asperger's, a mild form of autism. Three Mondays ago, he rose early and left home without telling his mother. "When I entered his room at 6:30 am and didn't see him, I assumed he had gone for another walk," she says. It was a school day. After Neli left home early that morning he walked two miles to Porter Library on Parkway Blvd. "He goes there frequently. There's a teen room there, and he enjoys it," says Lisa. The library was closed, so he sat under a tree, in the grass, at the front of the building. The parking lot at Park Ridge Elementary, about 400 feet to the west, was filling up. According to officials reports, someone at the school called police at about 8:38 am to report a suspicious person sitting outside the library, "possibly in possession of a gun." A bulletin went out with Neli's description, and officials, concerned that a gunman was on the loose, ordered a school lockdown and set up a search perimeter. When police arrived at the library, Neli was gone. Unaware of the report, and impatient for the library to open, he began walking in the direction of the high school. A forested green belt of trees some 500 feet-wide with a well-worn path separates the school from nearby homes. At about 9 am, a "school resources officer" who is also a Stafford County Sheriff deputy approached Neli. That's when accounts begin to diverge. Lisa said her son complied with a search, which failed to find a weapon. Police say Neli "attacked and assaulted the deputy for no apparent reason." Neli told his mother that the school officer threatened him, and that Neli said "You're harassing me. You're not allowed to do that. I know my rights," then turned and walked away. According to Neli, the officer grabbed him from behind and choked him. Police reports say a scuffle ensued, during which the officer pepper sprayed Neli. The police version, which you can read here, says Neli then took the spray from the officer and turned it on him. According to Lisa, Neli said he took the spray and ran into the woods. The deputy, Thomas Calverley, reportedly suffered a cut to the head and a broken ankle, and underwent surgery. By this time sheriff deputies were combing the area with search dogs, and at least one TV news crew offered a breathless live report of the manhunt. Neli somehow eluded the dragnet for another 45 minutes before being spotted and arrested in the high school parking lot, shortly before 10 am. No gun was found "and subsequent investigation has indicated that that a gun was not actually seen by the reporting parties," according to the official report. Lisa learned of the arrest at 10:30 am, when she called the police to report that her son was missing. "I was told that he was in custody and was currently being questioned but I was not told why," she said. "They wouldn't tell me anything, and wouldn't allow me to visit him. I told the police that Neli has autism, but they didn't seem to care." For the next 11 days, Neli was held without bail, and in isolation at the Rappahannock Regional Jail. Police allowed Neli's school counselor to visit, and she relayed messages and information to Lisa, who was allowed only one visit. "He wasn't able to speak or communicate with me. He appeared to be in a catatonic state," Lisa says. She is understandably frustrated and angry. "The actions that were taken by the police that day were excessive in the least and grossly mishandled," she wrote on a website started to counter inaccurate local media reports. "Someone says 'I see a suspicious black male' and he 'could' have a gun, while all my son was doing was sitting in the grass at the library. And you shut down six schools and go out on a manhunt for this dangerous black man who was sitting in the grass. Anyone can read between the lines and see that this just doesn't add up." Neli is from a military family, and during his 18 years has lived in Florida, Germany, Oklahoma and Georgia. Seven years ago his family moved to Stafford, a sprawling bedroom community about an hour south of Washington, DC. The family struggled to find appropriate school placement, finally settling on a private school. "The public high school was crowded, with about 30 kids to a class. Neli wasn't getting the attention he needed, and his self esteem was slipping." But he had never been in serious trouble. Never like this. Lisa heeded the warning signs. A month earlier, she asked Neli how he would feel about wearing a medical alert bracelet that identified him as a person with Asperger's. "He said that he didn't have a problem with that, but I didn't follow up. I'm just kicking myself for that," she said. Lisa, who works as a defense contractor, had also asked for a two month leave of absence to spend more time with Neli. That Monday was her first day off work. Her husband, Neli's stepfather, retired from the Army and is currently stationed in Iraq as a military contractor. As Neli's time in isolation dragged on, police interrogators found him non-responsive and disturbed, and a judge ordered the young man transferred to a state mental institution for 30-days of treatment and evaluation. If the case is not resolved by then, he will end up back in jail. The hospital is a two-and-a-half hour trip from Stafford, which Lisa says she has made four times. Horrified, she watched her son's mental state worsen with each visit. "He is locked away and doesn't understand why," says Lisa. "He's been through an ordeal." That ordeal has also changed Lisa, and the way she thinks about race, the police, and her community. She suspects Neli's arrest was in part racially motivated, but it is not a charge she makes lightly. "I used to donate money to the police benevolent society. I never imagined something like this could happen," she says. "I don't think in terms of 'watch out for those kinds of people' or 'you need to be scared,'" she says. "I grew up in south Florida. That's a melting pot of cultures. I know there are good people and bad of every race." Her life in the military, she says, has brought her friends "of every racial background." Has the ordeal changed her views on race and racism? "It has," she said, her voice trailing off. "It most definitely has."